This contemporary dream kitchen was designed to reflect the meaning in synched elements. Having that handless look we incorporated a second texture in horizontal grain Cleaf. 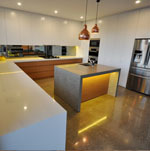 We also added a 60mm Caesarstone bench top and a 100mm polished concrete bench top to the main island. 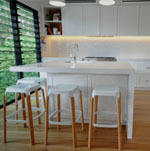 A family run company in Sydney that provides kitchens, wardrobes, storage solutions, shop fittings & vanities. 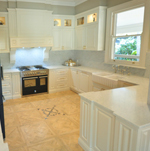 What style of kitchen would you like? Is there anything else you would like to mention that may be relevant?